Malaysia's Primary Industries Ministry secretary general Malaysia’s Primary Industries Minister Teresa Kok, Indonesia's Coordinating Minister for Economic Affairs Darmin Nasution and Deputy Minister for Food and Agriculture and Coordinating Minister for Economic Affairs Musdhalifah Machmud announced both countries sidestepping EU's palm oil trade curb. KUALA LUMPUR: Malaysia and Indonesia are not participating in the EU’s Indirect Land Use Change (ILUC) Workshop related to biofuels in Brussels, Belgium. In a statement on Thursday, the Council of Palm Oil Producing Countries (CPOPC) explained that it was because of the likelihood of the EU using the ILUC’s land use criteria to justify phasing out or restricting palm oil in the EU's Renewable Energy Directive II (REDII) mandate. “As oil palm producing countries, Malaysian and Indonesia will address various challenges emerging from the EU's REDII,” CPOPC said, adding that both countries were concerned that the proposed ILUC concept would likely discriminate against palm oil in the EU market. "Both Indonesian and Malaysian governments have agreed not to participate in the EU's ILUC workshop,” it added. The CPOPC is an intergovernmental grouping set up by the world's two largest palm oil producers and exporters, Indonesia and Malaysia. CPOPC announced the need to consolidate and increase biodiesel mandatory programmes in Indonesia and Malaysia, as well as to encourage the use of palm biodiesel in consumer countries such as China. On the same note, the CPOPC also announced Colombia, Latin America's largest palm oil producer and the world’s fourth, as its new member. 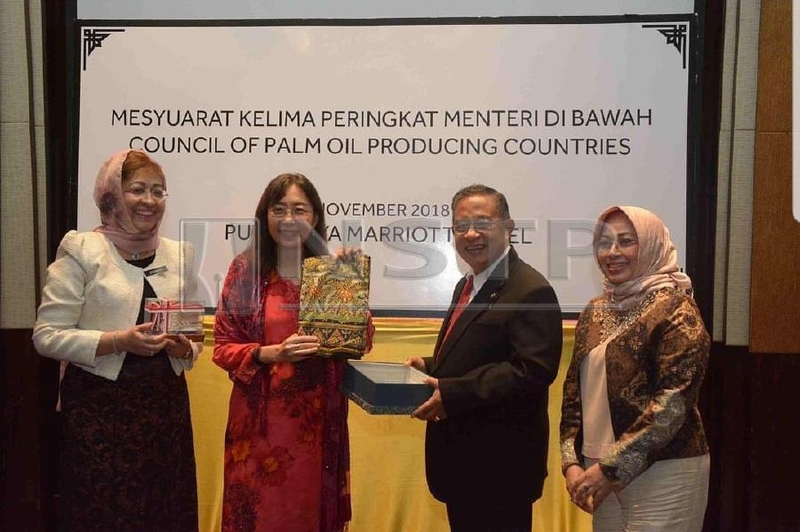 Primary Industries Minister Teresa Kok said Colombia's reputation would help strengthen the council and provide a strategic partnership in promoting the interests of palm oil producing countries. "The formal involvement of more palm oil producers in CPOPC is crucial in strengthening Malaysia and Indonesia's efforts to counter EU's negative campaign against palm oil," she told a press conference after attending the 5th Ministerial Meeting of the CPOPC here on Thursday. Indonesia's Coordinating Minister for Economic Affairs Darmin Nasution and Deputy Minister for Food and Agriculture and Coordinating Minister for Economic Affairs Musdhalifah Machmud were also present at the meeting. Darmin said Indonesia and Malaysia expressed dissapointment over the significant anti-palm oil campaign triggered through various non-governmental organisations and even regularly supported by legislative processes in some importing countries that discriminated palm oil.